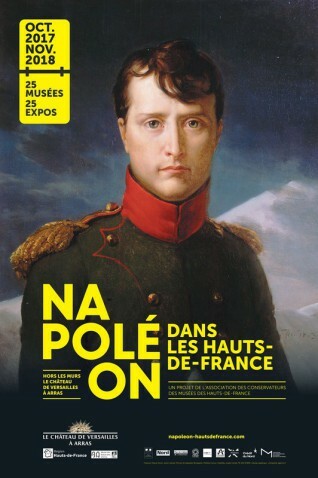 From 7 October 2017 to 4 November 2018, 25 museums and cultural institutions in the Hauts-de-France region will be taking part in the “Versailles to Arras” project devoted to Napoleon, during the major exhibition Napoleon: Images of the Legend at the MUSÉE DES BEAUX-ARTS D’ARRAS. A programme based on the varied collections of these institutions will show the vitality and breadth of the arts in the Napoleonic era (fine arts, furniture, decorative arts, prints, etc.) as well as the artistic and historical wealth of a complex personality. This project has been undertaken in partnership with the ‘Association of Museum Curators of the Hauts-de-France’, who created the programme of events ‘Napoleon in the Hauts-de-France’ to complement the ‘Versailles to Arras’ project. The ambition of “Napoleon in the Hauts-de-France” is to reveal the richness and diversity of regional museums by linking their collections with those of the public establishments of the Château, the Museum and the National Estate of Versailles in order to establish relations and connections between them. Thanks to the exceptional network they form, the museums of the Hauts-de-France can offer you a rich tour that reveals the many facets of Napoleon and his artistic and historical heritage.